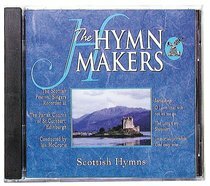 This beautiful addition to the much-loved Hymn Makers series includes such classics as 'The Lord is my Shepherd' and 'Light of the World,' all performed by the Scottish Festival singers. A moving experience! About "Scottish Hymns (Hymn Makers Series)"
Recorded with a full choir and the Sheffield Salvation Army band, the most recent addition to this enormously popular series features 'Be Thou My Vision', 'Great is Thy Faithfulness' and 'At The Name of Jesus'.